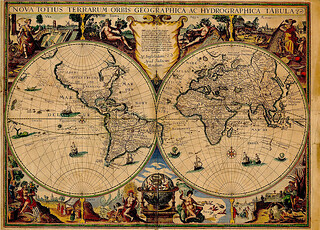 When I was growing up, my parents kept a paper atlas in the car at all times. It was a think book of maps covering a certain geographic area entirely, listing every street, back road, hospital, park, etc. To find a particular road in this atlas, you looked in the index where all the roads were listed alphabetically. The index would tell you what page the street was on and what grid on the page. It was then up to you to locate the street within the grid and figure out how to get there from wherever you were. Getting lost was common in the days of paper atlases, and in order to get your bearings, you had to drive until you found a named street, then find it in the index, then follow along the map until you found where that street intersected another street, then figure out how to get from there to a place you were familiar with. Rand McNally still sells atlases like this. Recently, my 4 year-old daughter has started showing an interest in maps. She's seen some cartoons where the characters look at maps and she has been pretending that various pieces of papers are maps. So the other day I let her hold my phone while we were driving home. She was very intrigued and interested in figuring out how the maps worked. I showed her how to move around, zoom in and out, and how to push the "my location" button to zoom back to our current location. She was very interested and followed our progress the whole way home, announcing each time she watched us turn onto a different road. She even started asking what the various icons on the map meant, and then announcing each time we passed a store. This got me thinking about what my childrens' experience with maps will be as they grow up. Paper atlases still hold a place in the world, for times when an Internet connection isn't available, or as an inexpensive option, or during a zombie outbreak. But for the most part, the days of using paper maps are over. My children will likely never use a map that doesn't show them their current location. Think about that for a minute. Maps have been used for thousands of years and yet they always required manually figuring out your current location. It's only been within the last 10 or 15 years that GPS and fast mobile Internet have enabled always up-to-date maps that already know where we are. Things like automatic navigation, live traffic information and voice guidance are all very new things that young children today will grow up with. The simple concept of maps has been radically changed within the last decade and our children get to grow up having it be a common, everyday thing. Our children will likely never experience being "lost" while visiting a new place. They will probably never need to ask a local for directions. And they will probably never experience an out-of-date map that doesn't show that newly opened highway. It's kind of incredible to think about that. The simple map, a stalwart of civilization for generations has changed so much in just the past few years. What new advances will our children's children get to grow up with?